Regular readers will recall the Highland Council press release which stated that further test pits would be dug at the Kingsteps Quarry. The Council stated: "Once all survey results have been analysed - and if required - appropriate actions will be taken to remediate the area for continued public access. If required, the Council will apply to the Scottish Government for Vacant and Derelict Land Funding to improve the site." They also said: "The work comprises excavation, by hand and mini-digger, of trial pits across the site..." More details here. 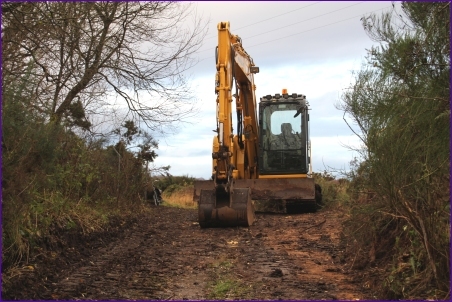 One of our regular readers, Dave, contacted us, he told us that a 7ft wide road excavator was at work and that in the wet conditions the paths were suffering badly and had turned "into a morass of liquid mud in places". This morning we went for a look, no work was ongoing but a large machine was parked a little into the quarry. See image below. Further into the quarry it was apparent that the paths had indeed suffered and all indications were that the work had proceeded on a scale larger than that detailed in the Council's press release. More images here. “We have been in further liaison with the contractor regarding works currently underway in Kingsteps Quarry and have given the go-ahead for contractors to continue. The machinery in use has been accepted as the most appropriate for the purpose and contractors are making efforts to minimise damage to paths. Whilst some surface damage is inevitable due to the currently wet ground conditions, funding for the work is time limited and it is not an option to wait for perfect conditions. The excavator is expected to move off site within 5-6 days. Dave has also told us that he has had a responses from Michael Green, Liz MacDonald and the planning department and they have told him that the Highland Council Ranger service will be keeping an eye on the area and that the contractors will reinstate the path through the former quarry. Highland Council seem to be saying they have access to special funding to sort the place out a bit. Let's hope the pits don't reveal anything nasty though. This area is a good public amenity and wildlife resource too, a few issues like Giant Hogweed but hopefully nothing that can't be put right providing the Council still exists in enough numbers to do something after the forthcoming cuts. Can remember a BSA Goldstar getting thrown into the dump complete and in very good condition but water got into the engine as why it was dumped there. If found can i put first reserve on it.